www.photomacrography.net :: View topic - Hello World! Posted: Tue May 03, 2011 2:15 pm Post subject: Hello World! 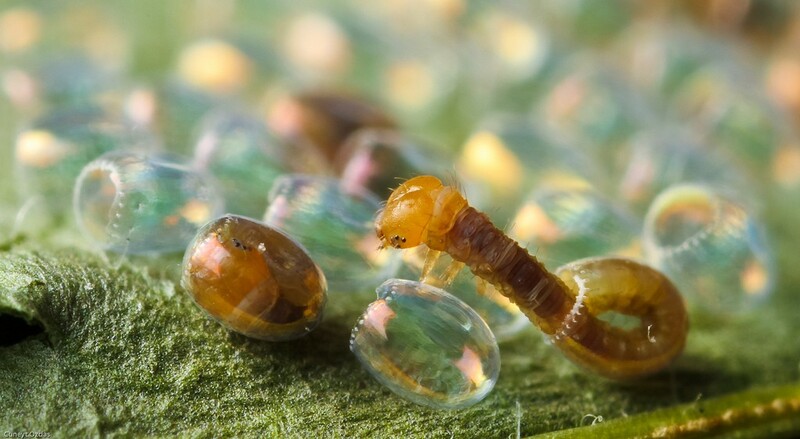 Here is a hatching egg with a looper caterpillar emerging. I also took a video with a bright LED light, but I still need to stabilize the video before posting since it's pretty shaky due to lack of the tripod in my setup. Click here for a higher resolution in Flickr. Beautiful! Love the one you can see curled up in the egg and the transparent egg cases, lovely shot! Nice, but it might be a much stronger image if you cropped out some of the background ? I think you are right. I kinda liked the colors caused by the interference thus decided to keep some of the background but I agree that it makes the image too busy. I'll make another version with a different crop. Beautiful picture, I love those reflections on the eggs. If you play around with the crop and get something you like better, be sure to show us that too. Very nice shot. Never seen anything like it. I like the background, it gives context that you wouldn't get if you cropped a lot of it out - context that you don't get very often in a shot this close. I love this photo. Well done. missed that one, excellent shot! I missed it first time around. Thanks for the second chance. Excellent, love the BG too. I wonder, do they eat their way out of the shell or burst out on that seam?